The only Pardo 43 Available in the USA, new 2019 model, loaded with options and ready for delivery. Very well equipped, ready for new owner. The amazing Pardo 43 now in North America. The Pardo, runaway success in Europe with over 47 sold, (2019 production sold out). This is the only new one available in the USA now. Equipped with the upgraded engines, hydraulic lifting stern platform, upgraded generator and tropical A/C option, plus full LED light package and much more! 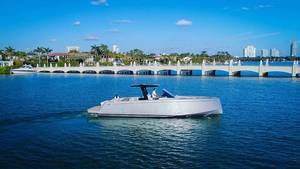 The Pardo 43’s V-Hull has a 16° deadrise angle at the transom and more than 50 at the bow. This ensures greater stability and smoothness in all sea conditions as well as easy maneuverability and faster planning. In addition, the Pardo 43 has two strong points. First, the vinylester resin infused hull, creating a unique monolithic form together with the keel. Second, the side and the deck, that are made in high density PVC sandwich. This ensures optimum structural rigidity and excellent thermal and acoustic insulation. The walk around design is one of the main advantages of the deck: it guarantees extra space and facilitates safe access to the bow sundeck. As in very large yachts, an optional longer stern platform can be used to step on or off board, take a swim, a shower outside or as an extra entertainment area equipped with mattresses, poufs or chaise lounge.